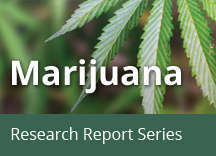 Home » Publications » Research Reports » Marijuana » Is marijuana safe and effective as medicine? The potential medicinal properties of marijuana and its components have been the subject of research and heated debate for decades. THC itself has proven medical benefits in particular formulations. The U.S. Food and Drug Administration (FDA) has approved THC-based medications, dronabinol (Marinol®) and nabilone (Cesamet®), prescribed in pill form for the treatment of nausea in patients undergoing cancer chemotherapy and to stimulate appetite in patients with wasting syndrome due to AIDS. The FDA also approved a CBD-based liquid medication called Epidiolex® for the treatment of two forms of severe childhood epilepsy, Dravet syndrome and Lennox-Gastaut syndrome. It’s being delivered to patients in a reliable dosage form and through a reproducible route of delivery to ensure that patients derive the anticipated benefits. CBD does not have the rewarding properties of THC. In addition, several other marijuana-based medications have been approved or are undergoing clinical trials. Nabiximols (Sativex®), a mouth spray that is currently available in the United Kingdom, Canada, and several European countries for treating the spasticity and neuropathic pain that may accompany multiple sclerosis, combines THC with another chemical found in marijuana called cannabidiol (CBD). Researchers generally consider medications like these, which use purified chemicals derived from or based on those in the marijuana plant, to be more promising therapeutically than use of the whole marijuana plant or its crude extracts. Development of drugs from botanicals such as the marijuana plant poses numerous challenges. Botanicals may contain hundreds of unknown, active chemicals, and it can be difficult to develop a product with accurate and consistent doses of these chemicals. Use of marijuana as medicine also poses other problems such as the adverse health effects of smoking and THC-induced cognitive impairment. Nevertheless, a growing number of states have legalized dispensing of marijuana or its extracts to people with a range of medical conditions. An additional concern with "medical marijuana" is that little is known about the long-term impact of its use by people with health- and/or age-related vulnerabilities—such as older adults or people with cancer, AIDS, cardiovascular disease, multiple sclerosis, or other neurodegenerative diseases. Further research will be needed to determine whether people whose health has been compromised by disease or its treatment (e.g., chemotherapy) are at greater risk for adverse health outcomes from marijuana use. 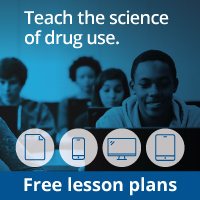 Additionally, NIDA funded two studies that explored the relationship between marijuana legalization and adverse outcomes associated with prescription opioids. The first study found an association between medical marijuana legalization and a reduction in overdose deaths from opioid pain relievers; an effect that strengthened in each year following the implementation of legislation.81 The second NIDA-funded study was a more detailed analysis by the RAND Corporation that showed legally protected access to medical marijuana dispensaries is associated with lower levels of opioid prescribing, lower self-report of nonmedical prescription opioid use, lower treatment admissions for prescription opioid use disorders, and reduction in prescription opioid overdose deaths.82 Notably, the reduction in deaths was present only in states with dispensaries (not just medical marijuana laws) and was greater in states with active dispensaries. It should be noted that the population-based nature of these studies, and the two above, do not establish a causal relationship or give evidence for changes in individual pain patient behavior and caution should be used when interpreting their results. To date, research into the effects of cannabis on opioid use in pain patients is mixed. Some data suggest that medical cannabis treatment may reduce the dose of opioids required for pain relief,83,84 while another NIH-funded study found that cannabis use appears to increase the risk of developing nonmedical prescription opioid use and opioid use disorder.85 Though no single study is definitive, they cumulatively suggest that medical marijuana products may play a role in reducing the use of opioids needed to control pain but that these products don’t come without risk. More research is needed to investigate the potential therapeutic role of marijuana including its role as a treatment option for opioid use disorder and its ability to reduce specific types of pain.